PLANO, Texas--(BUSINESS WIRE)--Feb. 1, 2018-- Cinemark Holdings, Inc. (NYSE: CNK), a leader in the motion picture exhibition industry, announced today the grand opening of its new 10-screen theatre in New Caney, Texas. 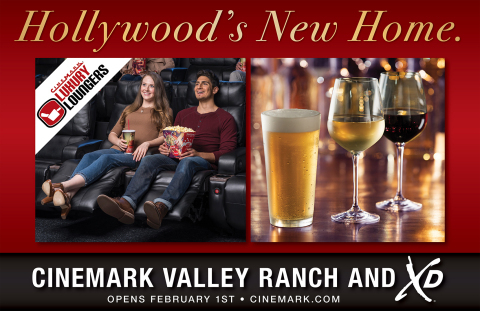 Located at 21750 Valley Ranch Parkway, the new Cinemark Valley Ranch and XD will feature Luxury Lounger electric recliners in all auditoriums, an XD: Extreme Digital Cinema auditorium and a Cinema Café with an expanded menu including beer, wine, and frozen drinks. Moviegoers can reserve their seats and get tickets at https://www.cinemark.com/texas/cinemark-valley-ranch-and-xd. In the upcoming weeks at the Cinemark Valley Ranch and XD theatre, Movie Club members and film fans alike can see a variety of Hollywood’s blockbusters including Maze Runner: The Death Cure, Fifty Shades Freed, Peter Rabbit and Black Panther.